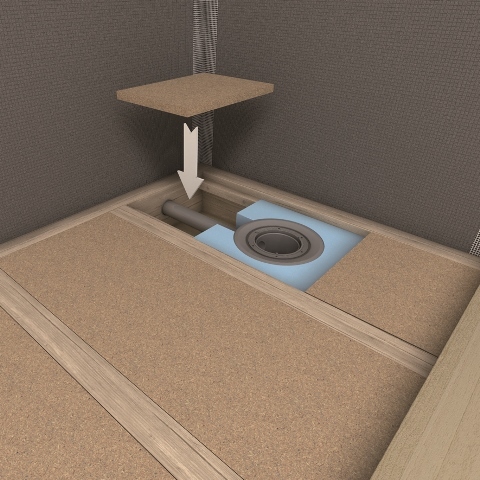 The wedi Fundo Ligno floor element was specially developed for use in old and new builds with suspended timber floors. 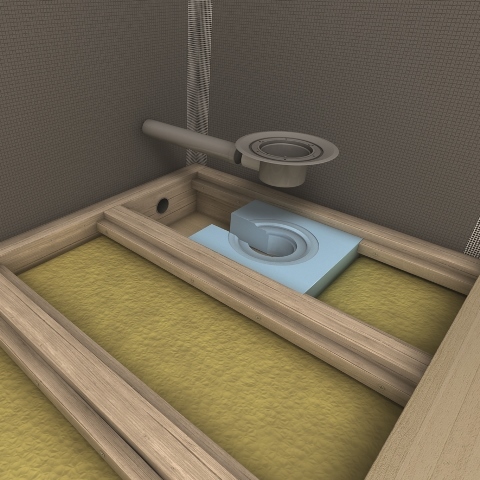 With the integrated version shown here, the seal is created on the neighbouring timber construction using the wedi Fundo sealing set. Step 1 Cut out the timber beam position in the Fundo Ligno shape and remove the insulating material underneath. Step 3 Build formwork (35 x 35 cm) in the drain pot area. Step 4 Nun den Ablauftopf anschließen und den Bautenschutzdeckel aufsetzen. Step 5 Now, connect the drain pot and attach the structure preservation cover. Create the holder for the Ligno element using timber boards, which are screwed onto the strips. Step 6 Check the drain position of the wedi Fundo Ligno element and adapt it, if necessary. Step 7 Fill the recess with earth-moist screed. Step 8 Insert the O-ring int the plastic frame`s groove from above and screw down the shower tray`s screw valve using sealing insert. Step 9 Apply tile adhesive all over the underside of the shower element. Step 10 Weight the element down for 24 hours. Step 11 Seal the joins and timber beam transitions with the wedi Fundo sealing set. Recommendation: Seal the complete timber floor area with wedi Dry & Flex. Step 12 Bring the drain frame to the height of the top tile edge and secure in the bed of adhesive. If the tile is thicker than 15 mm, use the ramping element to adjust the height. Step 13 Tile the element. 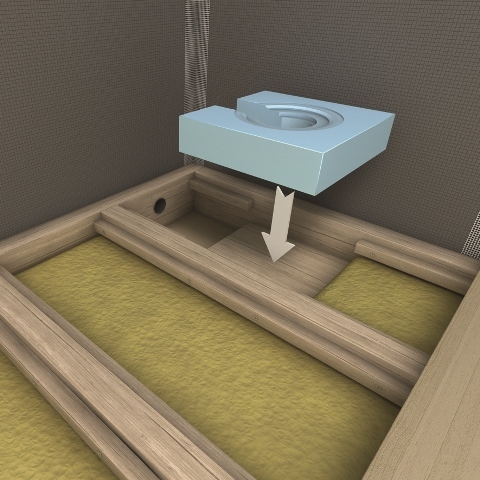 Insert the shower insert and odour trap. Step 16 Alternatively you can use the Fundo Ligno drain substructure element.